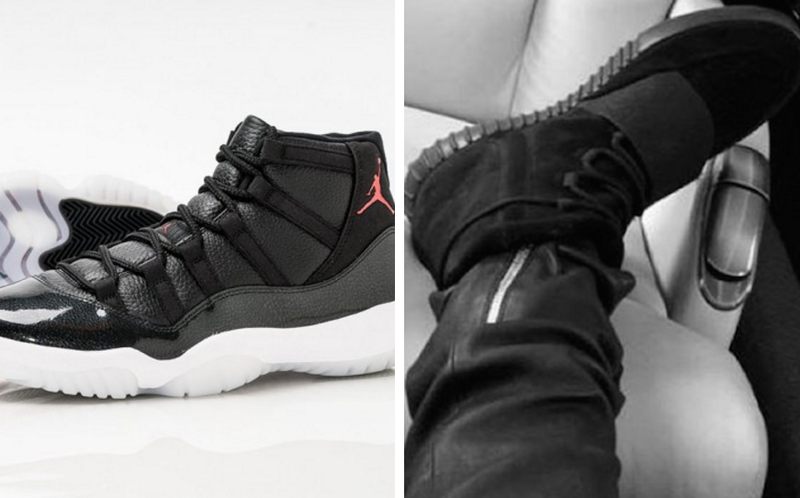 Air Jordan 11 "72-10" Release Pushed Forward; Is It Because of Yeezys? Some surprising news has came out from Jordan Brand recently, regarding the much hyped release of the Air Jordan 11 Retro "72-10." Initially scheduled to come out on December 19th, the shoe has now been pushed forward to a December 12th release. Retailers like Foot Locker and Footaction have confirmed the new release date, as well as Nike.com and Finish Line. It's unusual for Jordan Brand to push forward a release of a sneaker, especially something like the Jordan 11s, which usually releases the weekend before Christmas as evident last the past releases of the "Gamma" and "Legend Blue" 11s. Is it due to the Yeezys coming out on the same day? The all-black colorway of the Adidas Yeezy 750 Boost is scheduled to drop on December 19th for $350, which could have pushed attention away from the Jordan 11s. Many have noticed that Jordan retro sneakers have been sitting on shelves lately. The recent release of the Air Jordan 6 Retro "Maroon," didn't sell out to many people's surprise, despite having the very hyped "Nike Air" branding on the back. Other shoes like the "Aqua" 8s and the "Bordeaux" 7s also sat on shelves and didn't sell out instantly, something we are not accustomed to with hyped retro sneakers that have released by the company in year's past. Since the announcement, Jordan Brand has also pushed the release of the "Chrome" 8s forward by a week, which now will be releasing on the 19th. This one is expected to sit on shelves anyways, so it is not a surprise. So what does this all mean? Has Yeezy jumped over the Jumpman? I wouldn't necessarily say so. Come on guys, this is Jordan Brand we are talking about. I'd be shocked if the 11s sat on shelves, whether they released on 12th or 19th. With that said, Jordan Brand has been making A TON of more pairs this year of sneakers than years of old. They are making sure almost everyone has a chance to buy a pair, from the casual consumer to the biggest sneakerhead. And it looks like they are making a ton of more money now with that method. Pushing the release dates forward could also mean something Jordan Brand might be hiding from us. The past few days, rumors have been swirling of another Air Jordan 11/29 pack releasing like last year's "Pantone" one. Many say the red "Melo" 11 PE could be releasing in a pack later this month with the Air Jordan 29s. With the Chrome 8s and 72-10 11s both being moved a week forward, this could save space for this rumored pack to drop on the 26th. Of course, this is all just hypothetical, but we will see. Anyways, to all those copping the 11s this weekend, good luck. I know I'll be trying to grab a par.